Lingaraj Temple is believed to be the oldest and largest temple of Bhubaneshwar. The temple of Lingaraja is highly revered by the followers of Hinduism. Located at Bhubaneshwar in Orissa, Lingraj Mandir is easily accessible from the city. The term 'Lingaraj' suggests 'the king of Lingas', where 'linga' is the phallic form of Lord Shiva. In the 11th century, Lingaraj Temple was built by the King Jajati Keshari, who belonged to Soma Vansh. It is thought that when the King shifted his capital from Jaipur to Bhubaneshwar, he started the construction of Lingaraj Temple. The remarkable structure of the temple gives the tint of Kalinga style of architecture. The aesthetic sculptures look at their apex in this architectural exhibition. Erected in red sandstone, Lingraj Temple has the stone of the darkest shade. 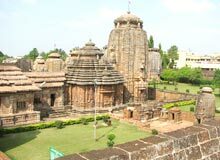 The huge temple complex covers the vast lands of Bhubaneshwar in a stretch. The tall spire of the temple extends to the height of 55 meters and literally, dominates the skyline of Bhubaneshwar. The spacious courtyard comprises 50 small shrines that are dedicated to several Gods of the Hindu pantheon. All the shrines are safe under the kind fortification made by the massive walls that are carved beautifully with sculptures. One can enter the temple complex through 'Simha Dwara' (the Lion's Gate), where lions flank both the sides, crushing elephants under their feet. An optical effect is produced with the deep cut warped lines that run perpendicularly on the spire. Due to this, the temple looks much larger than what actually it is. Moreover, the spire of the temple has diminutive replicas of itself in the steeples that are incorporated perfectly in the entire structure of the temple. Actually, the temple is divided into four parts, the Garbh Griha, the Yajna Shala, the Bhoga Mandap and the Natya Shala respectively. In the Garbh Griha (Sanctum Sanctorum), the lingam of Lord Shiva is regarded as 'Swayambhu' (Self-originated) and it is worshipped as both Lord Shiva and Lord Vishnu. On the main entrance, one can see a trident (Lord Shiva) and Chakra (Lord Vishnu) on the either side of the door. The concord of the two sects can be seen here, where the deity is worshipped as Hari-Hara. The term 'Hari' refers to Lord Vishnu and 'Hara' refers to Lord Shiva. This massive image of 'Linga' appears to be of granite stone. The 'Lingam' is bathed with water, milk and bhang every day. Apart from Garbh Griha, the 'Nata Mandir' provides a hint for its close alliance with the devadasi tradition. Besides the Lingam, the parsva devta adores the site, where Lord Ganesha, Lord Kartikay and Goddess Parvati are placed in different directions. All the images are huge and present an excellent workmanship of the artists. The images are festooned with rich draperies and ornaments. Lingaraj Temple depicts the rich legacy of Indian culture and traditions. The colossal temple attracts thousands of devotees and pilgrims to its doorstep every year. The spiritual ecstasy offered by the temple is worth feeling for once.